It's the second-largest bird in the world and native of Australia, so Colby says it is most definitely someone's pet. The Emu on the loose in Bow, New Hampshire that captured headlines nationwide has finally been captured and is now safe at a Wildlife sanctuary in Henniker. Wildlife rehabilitator Maria Colby has been working with the Bow Police Department and residents to get hold of the Emu since it was first spotted a few weeks ago. Colby says for a domestic animal, three weeks in the wild is a long, dangerous journey. She says it took residents a couple of hours and a few injuries to get the bird into a cage on Sunday morning. Colby has been contacted by a man in Vermont who says he is missing a pet emu. 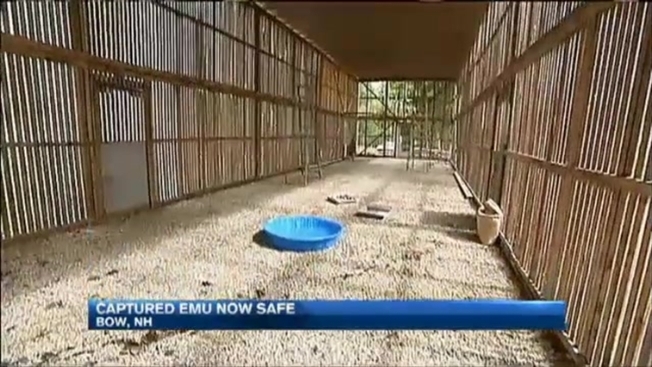 While Bow Police continue to investigate where the bird came from, Colby is glad the story of the elusive emu has a happy ending inside her sanctuary.